I always thought that when I turned 40, I should cut my hair short. After all, this would be the point where I would stop looking so young and fertile, and what better way to show it than through my hair? There was a point when women over 40 all seemed to have shorter hair: Betty White, Florence Henderson, my mom. But then I started to see my own friends over 40 and they weren’t wearing their hair any differently. And I realized Betty, Florence and my mom all had short hair before they were 40 as well. But still, I grew my hair long all throughout my 30s because I planned to cut it when I turned 40. So that’s what I did. When I was in 8th grade, I cut my hair really short, which was a trendier style at the time. But it was so short that when I went to get my hair done for my Confirmation, the hairdresser mistook me for a boy. I vowed then and there never to go shorter than what seemed like an unmistakably feminine chin length. In the mean time, my body is much more womanly, so I could probably get a shorter cut, but I just won’t. So I got a chic bob. But I missed my long hair! I tried to stay with it, but I just kept fantasizing about all the low buns and elaborate braids I was missing out on. I grew my hair out. Now, I’m 45 and thinking that its time to cut it again. I never do any interesting long hairstyles. 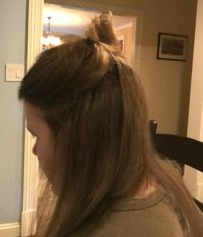 Its either down or up in a sloppy topknot or maybe a ponytail. So before I get it chopped off again (I’m thinking about either a middle length like Emma Stone in La-La Land. Or a choppy, really short bob like Gwynneth back when she was dating Brad Pitt. Remember that? But first, a test. I’ve been trying some hairstyles and seeing if I could really do them on the regular. But how to know which long hairstyles are also age-appropriate. In my quest to find something beautiful, wearable and dare I say mature, I thought of my own style icons. I know I am not as beautiful as these women, but I’m aspirational by nature. The first person that I thought of was Nancy Botwin, not actually a real person, but a character from the TV Show Weeds. She was in her forties when the show was on. There was this one hairstyle she wore a few times there the had low buns in the back like this. I have actually rocked this one before, and it’s somewhat silly, but you can’t really tell what it is unless you are looking closely, so it is something I could do. 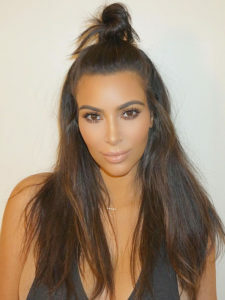 Another do-able style that has recently become on-trend is the half bun. Nancy was on it a decade ago. I could do one like hers. I used this tutorial. The method is great. Great to have the info on what to do about your extensions, but I don’t wear any. Maybe I should . . .
Next is someone who has a go to hairstyle that is anything but basic but looks do-able. She’s not a fashion icon of mine and I’m not particularly a fan, but I loved the pony tail Jennifer Lopez wore on The Wendy Williams Show. I will push my limits on this one, but not as far as Beyonce did. Pretty sad compared to J-Lo, but I felt fierce. 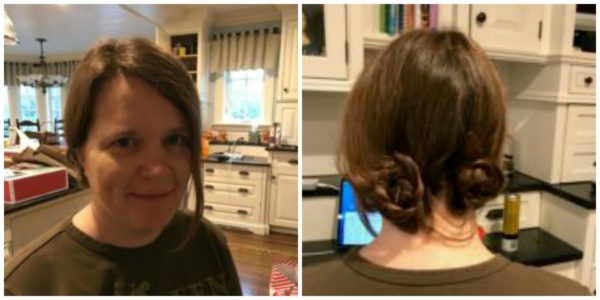 What are my takeaways: Old ladies can do fun hairstyles and not look too silly! Doing a special hairstyle takes extra work but it is worth it (depending on how focused you may be on your appearance on any given day). Finally, are there youtube hair or beauty tutorials that don’t start with a phrase that includes “Guys.” “You guys! “Hi guys!” “Hey Guys!” Someone should do a compilation. Get on that, would you? Well, tune in next week to see if I’m feeling more like Nancy Botwin or Emma Stone. In the hair department, of course!